Overall view of the Tower from the River, with the White Tower and Grand Storehouse visible. Two cranes and cannon on the wharf. 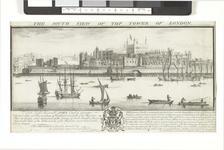 Drawn and engraved by Samual and Nathaniel Buck. Published 'according the Act of Parliament March 25th 1737'. Dedicated 'To the Right Honourable JOHN Earl of Leicester/ Viscount Lisle and Baron Sidney of Penshurst, Constable of his Majesties/ Tower of London, Lord Lieutenant of the County of Kent, Knight of the Most/ Honourable order of the Bath, and one of his Majesties most Honourable Privy Council/ This Prospect is humbly Inscrib'd by/ his Lordships most Obedient servants./ Samuel. and Nathaniel Buck/ THIS famous citadel is commonly reported to owe its Foundation to one of ye Caesars. Tho'/ History is silent yet 'tis probable London which was very considerable under ye Roman Govern-/ -ment was not then unprovided with a proper Place of Defence. This well known Constantine the/ great wall'd ye whole City which was then about 3 miles round. Where then wou'd be a more fit/ part than this where ye wall ended on ye eastward for a Fortress against any Invasion by Water ?/ Its certain here was a Fort long before ye Conquest, call'd in ye British Language Bringwin or Towr-/gwin from its Whiteness. 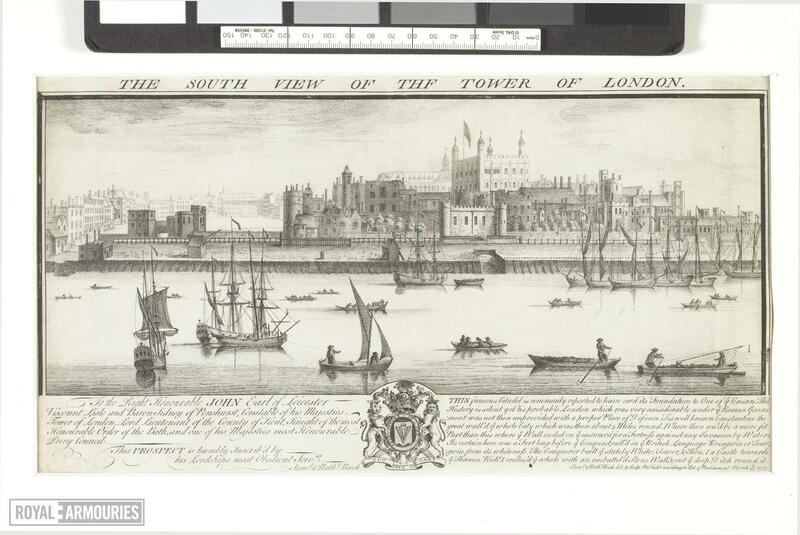 The Conqueror built ye stately White=Tower, & Hen: I a castle towards/ ye Thames. Richd. I enclos'd ye whole with an embattl'd stone wall, & cut ye deep Ditch round it.' Arms of Earl of Leicester with coronet, crest and supporters.